Carmody, Shane, ‘The Remarkable Library of Bishop Goold: its creation, loss and rediscovery’, pp.23-31. Kempster, Hugh, ‘Remembering Charles Joseph La Trobe’ - sermon delivered at St Peter’s Eastern Hill, pp.5-7. Marsden, Anne,	‘In Search of Sophie La Trobe and her Contemporary Women Settlers in pre-goldrush Port Phillip’, pp.12-18. O’Brien, Michael, ‘Charles La Trobe and Hugh Childers: the ladder of success in Victoria’, pp.19-22. Shaw, Davydd, ‘Edward Byam Wight: enterprising pioneer in the Port Phillip District’, pp.32-39. Webber, Monique, ‘La Trobe's Garden City and the Lost Sculptures of Fitzroy Gardens’, pp.8-11. Chambers, Loreen, ‘Charles Joseph La Trobe at Addington Vale, 1856-1857: a year of hope?’, pp.45-53. Finlay, Lorraine. ‘Eliza Nelson and Dr John Singleton: incidents in the lives of two remarkable colonial memorialists’, pp.24-32. Heale, Walter, ‘District Surgeon to Chief Medical Officer: pioneer public health practitioners in Port Phillip District’, pp.15-23. Hiscock, Peter McL. ‘La Trobe and his Horses – testing times’, pp.5-14. Reilly, Dianne, ‘Kentish Ramblings: La Trobe rediscovers the picturesque English countryside’, pp.33-44. Clark, Ian D., ‘From Amiability to Acrimony: William Le Souëf and his relationships with George Augustus Robinson and Charles Joseph La Trobe’, pp.22-32. Kearsey, Irene, ‘La Trobe’s First Immigrants: the 1839 voyage of the David Clark’, pp.16-21. Kirsop, Wallace, ‘Kingsborough’s Antiquities of Mexico: some notes on Australian-held sets’, pp.50-52. McCann, Doug, ‘Charles Joseph La Trobe and the foundation of the Royal Society of Victoria’, pp.5-15. Priestley, Susan, ‘The La Trobe Golden Testimonial’ (1853), pp.42-49. Waugh, Max, ‘‘A Beautiful Site for a Town’: Governor Sir Richard Bourke and the establishment of the Port Phillip Settlement 1835-1837’, pp.33-41. Black, Maggie, ‘‘Quietly Slaughtered in Unknown Numbers’: the contemporary witness of Niel Black to the clash between settlers and Aboriginal people, 1839-1842’, pp.17-26. Cahir, Fred, ‘Charles Joseph La Trobe and his administration of the Wadawurrung, 1839-1853’, pp.5-16. Clark, Ian D., ‘A Fascination with Bunyips: Bunbury, La Trobe, Wathen and the Djab Wurrung people of Western Victoria’, pp.27-39. Land, Clare, ‘The haunting tale of Tunnerminnerwait and Maulboyheenner’, pp. 55-64. Reilly, Dianne, ‘Letters from Victorian Pioneers to Governor La Trobe, 1853’, pp. 40-54. Botham, John, ‘Captain “Old King” Cole: Port Phillip pioneer to Victorian patriarch’, pp.28-38. Gatehouse, Tim, ‘‘Our First Class Light’: La Trobe and the Cape Otway Lighthouse’, pp.15-27. Whitmore, Sylvia, ‘La Trobe, Lord Kingsborough and the the nine magnificent volumes of the Antiquities of Mexico’, pp.39-46. Woodhouse, Fay, ‘Surveying the Landscape: Robert Russell, Robert Hoddle and the first plan of Melbourne’, pp.6-11. Book Review – Hawkins, Patricia, Robert Russell: Artist of Early Melbourne, editor Fay Woodhouse, p.47. Anderson, Margaret, ‘Victoria’s First Bushrangers: a rousing tale of colonial times’, pp.31-37. Barnes, John, ‘In Search of La Trobe’, pp.5-11. 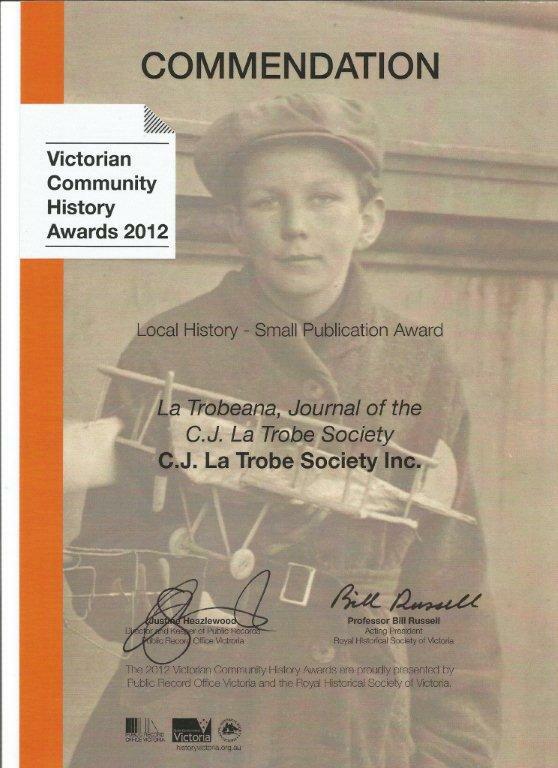 Lemon, Andrew, ‘La Trobe: Traveller, Writer, Governor, by John Barnes; a book review’- History Publication Award in the 2017 Victorian Community History Awards, pp.50-51. Priestley, Susan, ‘Impressions of Victoria, 1852: ‘a collection of everything from every place’’- Albert Purchas reporting from the colony, pp.22-30. Reilly, Dianne, ‘Walking on Water: Melbourne, the Yarra River, its punts, ferries and bridges’, pp.38-49. Woodhouse, Fay, ‘Politics, Power and Passion: Port Phillip before the gold rush’, pp.12-21. Barnes, John, ‘A Moravian “Among the Heathen”: La Trobe and the Aboriginal People’, pp.14-24. Clark, Ian D., ‘Aboriginal People and Frontier Violence: the letters of Richard Hanmer Bunbury to his father, 1841-1847’, pp.25-40. Presland, Gary, ‘The Kulin People and the Failure of the Aboriginal Protectorate during the Superintendency of C J La Trobe’, pp.5-13. Botham, Helen, ‘Remembering the Litlington Commemoration 1951’, pp.49-50. Bowman, Margaret, ‘Elizabeth Douglass’s Scrapbook’, pp.40-45. Davison, Graeme, ‘The Governor, the Captain and the Needlewoman: how my great-great grandmother arrived in Port Phillip’, pp.17-23. Keeble, Willys, ‘Colonial Orderly Rooms in Victoria’, pp.32-39. Macdonald, Judy, ‘John “Howqua” Hunter and the China connection’, pp.24-31. Susan Priestley, ‘Whitbourne Court cross links: research report’, pp.46-48. Reilly, Dianne, ‘Victoria’s Parliament’, pp.5-9. Whitmore, Sylvia, ‘Charles Joseph La Trobe and Contemporary Scientific Issues: mastodons, extinctions and the age of the earth’, pp.10-16. Armstrong, Helen, ‘Villa La Trobe: a rural residence - research report’, pp.43-46. 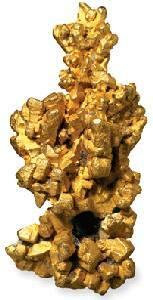 Barnes, John, ‘The La Trobe Gold Nugget’, pp.19-21. Botham, Helen, ‘Celebrating La Trobe the Artist at Ightham Mote’, pp.50-51. Chambers, Loreen, ‘The Letters of Charles Joseph La Trobe: a review’, pp.47-49. Christie, Robert, ‘Edward Jones Brewster: La Trobe’s bungling lawyer’, pp.29-35. Dessau, Linda, ‘Lieutenant-Governor Charles Joseph La Trobe… back to stay!’ Governor’s address at the unveiling of a bronze bust by sculptor Peter Corlett OAM at Queenscliff, pp.6-7. Priestley, Susan, ‘The La Trobe Dairy Farms’, pp.36-42. Reilly, Dianne, ‘A Family Legacy: Charles Albert La Trobe and his descendants’, pp.8-18. Ross, Daryl, ‘Charles Joseph La Trobe in Neuchâtel: Montmirail to Jolimont’, pp.22-28. Bowman, Margaret, ‘Educating Agnes: Agnes La Trobe and two of her teachers’, pp.14-19. Chambers, Loreen, ‘The Litlington Pleasure Gardens and Frederick Russell in the time of Charles Joseph La Trobe’, pp.28-36. Lesh, James, ‘Melbourne’s Famous Pet Dog: Larry La Trobe’, pp.37-45. Ross, Daryl, ‘La Chapelle de l’Ermitage, Neuchâtel’ - memorial chapel built by Rose Isabelle La Trobe, pp.20-27. Thompson, Murray, ‘La Trobe: the city of Man, the city of God’, pp.6-13. Burdon, Jonathan, ‘Medicine in Melbourne in the time of La Trobe’, pp.14-23. Chambers, Loreen, ‘The Long Farewell, by Don Charlwood: a book review’, pp.42-45. Heale, Walter, ‘Arthur O’Mullane MD: pioneer physician Port Phillip District’, pp.36-41. Heale, Walter, ‘Registration of Medical Practitioners in the Port Phillip District’, pp.24-30. Priestley, Susan, ‘The Virtuoso and the Count: La Trobe and Pourtalès with Washington Irving 1832’, pp.46-55. Pullman, Sandra, ‘James Wentworth Davis, pioneer of Alberton, Gippsland: a research report’, pp.31-35. Whitmore, Sylvia, ‘Charles Joseph La Trobe's Adventure in Mexico in 1834’, pp.5-13. Barnes, John, ‘La Trobe and Georgiana McCrae: fact and fiction’, pp.16-21. Botham, John, ‘The Good Old Rajah: and those who sailed in her’, pp.31-42. Gatehouse, Tim, ‘Edward Hulme: a lost Victorian artist’, pp.22-30. Gatehouse, Tim, ‘The Harington Family Crested Dinner Plate: a research report’, pp.43-45. ‘La Trobe’s Publications on the web’, p.47. Armstrong, Helen, ‘On William’s First Tooth: a poem by Charles Joseph La Trobe’, pp.42-43. Lack, Kate and Loreen Chambers, ‘Whitbourne and Whitbourne Court 1858-1866’, pp.15-27. Millie, Eva, ‘The Letters of Charles Joseph La Trobe: a legacy to us’, pp.28-34. Romanov-Hughes, Alexander, ‘La Trobe’s History of Victoria: a research report’, pp.35-38. Ross, Daryl, ‘Adolphe de Meuron, Swiss Pioneer: a research report’, pp.39-41. Wilkie, Douglas, ‘Ten Thousand Fathoms Deep: Charles Joseph La Trobe’s decision to postpone gold exploitation until after Separation, pp.6-14. The La Trobe Digitisation Project, p.48. The Letters of Sophie La Trobe 1845‑1853, p.49. Memorial Services for Charles Joseph La Trobe, pp.46-47. Pioneer Service St James’ Old Cathedral, pp.44-45. Tributes - John Joyce, Rhonda Noble, Margot Hyslop, p.5. Chernov, Alex, Governor’s Address for 175th Anniversary of La Trobe’s Arrival in Melbourne, pp.6-8. Clemente, Caroline, ‘La Trobe and the Pre-Raphaelites: launching a brilliant career in Melbourne, 1853’, pp.27-34. Grehan, Madonna, ‘Safely thro’ her Confinement: bearing and rearing babies in nineteenth century Victoria’, pp.10-18. Lemon, Andrew and Marjorie Morgan, ‘Superintendent La Trobe and the Cataraqui, Australia’s worst shipwreck’ – A G L Shaw lecture, pp.35-44. Reynolds, Sue, ‘La Trobe’s other library: Charles La Trobe, Redmond Barry and the Library of the Supreme Court of Victoria’, pp.19-26. Woodhouse, Fay, ‘La Trobe sites: a review’, pp.45-47. Armstrong, Helen, ‘The La Trobe Song: a research report’, pp.25-26. Barnes, John, ‘La Trobe: a prologue to his Melbourne years’, pp.6-13. Gatehouse, Tim, ‘Melbourne’s first Water Supply: the La Trobe Family’s contribution’, pp.34-40. Reilly, Dianne, ‘Two Gentlemen of Melbourne Town: Charles Joseph La Trobe and Redmond Barry’, pp.14-24. Sale, Peter W, ‘Feeding the Colony – feeding the World’, pp.27-33. Armstrong, Helen, ‘Celebrating Charles Joseph La Trobe (1801‑1875): a research report’, pp.25-29. Botham, Helen, ‘Remembering La Trobe in Litlington and East Melbourne’, p.41. Botham, John, ‘The Superintendent’s Superhighway’, pp.43-44. Edquist, Harriet. ‘The Other La Trobe: E L Bateman at the Melbourne Public Library, 1860‑1866’, pp.6-12. Gregory, Patrick, ‘Dear Jolimont: a narrative’, pp.30-35. ‘The La Trobe Society Banner#8217;, p.42. Priestley, Susan, ‘Tracing the Marine Residence at Mount Martha: a research report’, pp.21-24. Reilly, Dianne, ‘The La Trobe Clock: a research report’, pp.36-39. Wallace, Bernard, ‘The Enlightened Administrator and the Martinet Magistrate: Charles Joseph La Trobe and James Blair’, pp.13-20. Armstrong, Helen, ‘A La Trobe map’, pp.43-44. Barnes, John and Christopher Metcalfe, ‘’Farmer La Trobe' at Clapham House’ - and elsewhere in England , pp.24-28. Botham, John, ‘The Charles Joseph La Trobe Coat of Arms’ - research report, pp.29-30. Bowman, Margaret, ‘Portrait of the Artist as a young Settler: George Alexander Gilbert’ - A.G.L. Shaw lecture, pp.15-23. Chambers, Loreen, ‘Ightham Mote and Litlington Parish Church revisited’, pp.38-40. Gatehouse, Tim, ‘The La Trobe Family in Ireland’, pp.33-34. Kearsey, Irene, ‘A Hidden Image of Charles Joseph La Trobe’ – a mosaic mural by Napier Waller, research report, pp.41-42. Reilly, Diane, ‘Books and Culture in La Trobe’s Melbourne’, pp.7-14. Reilly, Diane and Helen Armstrong ‘The Latrobe/La Trobe Family Name’, pp.31-32. Botham, Helen. ‘Visit of Mrs Phyllis Murphy to La Trobe’s Cottage’, pp.32-33. Hughes, Bronwyn, ‘The Governor’s Window’ - the La Trobe Commemorative Window at the Chapelle de l'Ermitage, Neuchâtel, pp.11-18. Johnstone, Marion, ‘Cécile & Eleanora La Trobe’s Letter from Corcelles to Rose Pellet’, pp.25-28. La Trobe Brick - hand-made brick from La Trobe’s Cottage, p.36. Martin, Jack, ‘The La Trobe Digitisation Project’, p.31. Reilly, Dianne, ’An Anglo-Swiss Alliance: The Marriage of Charles Joseph La Trobe and Sophie de Montmollin of Neuchâtel’, pp.19-24. _____ ‘Neuchâtel in the Nineteenth Century’, pp.6-10. Ross, Daryl, ‘Les Squatters australiens: book review’, pp.29-30. Armstrong, Helen, ‘Mr La Trobe and Miss Drysdale: a research note’, pp.23-24. Botham, Helen, ‘Remembering Charles Joseph La Trobe at St Michael the Archangel, Litlington’, pp. 28-30. Chambers, Loreen, ‘Litlington’s Church of St Michael the Archangel and its Rector in La Trobe’s time’, pp.31-38. Chernov, Alex, ‘La Trobe Society Christmas Reception and Opening of the Exhibition ‘Early Melbourne Paintings’’, pp.5-7. Gatehouse, Tim, ‘The English Career of the Architect Benjamin Henry Latrobe’, pp.39-48. Houghton, Norman, ‘The Geelong Club; a Brief History of its Early Days’, pp.18-22. MacDonald, Helen, ‘Inhabiting Melbourne, 1835-45: Henry Condell and other Early Settlers’, pp.10-14. Priestley, Susan, ‘Boys and History; Litlington visit 1951’, pp.25-27. Reilly, Dianne, ‘Exhibition: Early Melbourne Paintings’, pp.8-9. _____ ‘Geelong - Places in the Footsteps of La Trobe’, pp.15-17. Blackwood, Lynn, ‘The Contribution of Ronald Gunn to our Knowledge of the Flora and Fauna of Tasmania’, pp.30-36. Darragh, Thomas, ‘Ferdinand Mueller and Charles La Trobe: ‘So Many Signs of Benevolence and Favour’’, pp.25-29. Gatehouse, Tim, ‘The Turkish La Trobe; the Career of Claude Alexandre de Bonneval, the Sultan’s Advisor at the Ottoman Court’, pp.46-53. Home, R. W. ‘‘La Trobe’s Honest looking German’: Ferdinand Mueller and the Botanical Exploration of Gold-Rush Victoria’, pp.9-16. Martin, Jack, ‘La Trobe Society Digitisation Project at the Public Record Office Victoria’, pp.57-59. Murphy, Anna, ‘In search of Three-Leaf Clovers: A Note on the Clover Glycine, Charles La Trobe and Threatened Species Recovery in Victoria’, pp.17-20. Priestley, Susan, ‘Crises of 1852 for Lieutenant-Governor La Trobe, Captain William Dugdale and Henrietta Augusta Davies’- A G L Shaw lecture, pp.39-45. Pullman, Sandi, ‘Charles La Trobe and Ferdinand Mueller’, pp.21-24. Wilson, Jane, ‘Charles La Trobe’s Contribution to the Establishment of the Horticultural Gardens at Burnley: Research Report’, pp.37-38. Book Review – Anderson Burgess, Alison, The French Closet, Tarrington, Vic., A. Anderson Burgess, 2012. Reviewed by Roz Greenwood, pp.54-55. Tributes – Dr Brian La Trobe, Dr Jean McCaughey AO and Mr Bruce Nixon, pp.6-8. Botham, Helen, ‘Edward La Trobe Bateman and Kolor’, pp.37-39. Broome, Richard, ‘Charles La Trobe’s View of Nature’, pp.9-18. Clarke, Adrienne E, ‘Introduction to Charles Joseph La Trobe’s 211th Birthday Party’, pp.6-8. ‘Correagh: Home of Wes and Cassie Rogers’, pp.20-21. Forth, Gordon, ‘Charles La Trobe and the Winters of Tahara and Spring Valley/Murndal’, pp.22-25. Gatehouse, Tim, ‘The American Ancestors of the La Trobe Family’, pp.46-51. Reilly, Dianne, ‘Charles La Trobe in the Western District of Victoria’, pp.41-45. ‘Professor A G L Shaw AO, 3 February 1916 – 5 April 2012: a tribute, p.5. Small, Peter, ‘Hamilton Club Welcome', p.40. Wallace, Bernard, ‘Charles La Trobe, the Hentys and Victoria’s South West’, pp.26-33. ‘Warrayure and Mount Sturgeon Plains’, pp.34-36. Carmody, Shane, ‘Charles La Trobe and the Uneasy Class’, pp.33-36. _____ ‘The Naked Saint: Sir Edgar Boehm’s St George and the Dragon’, pp.15-24. Chambers, John, ‘Christmas Cocktails Party Welcome: Charles La Trobe and the Melbourne Club’, pp.37-39. Hudson, Henry, ‘The Development of Port Phillip: a geological perspective’, pp.29-32. Martin, Jack, ‘Public Record Office Victoria/La Trobe Society Digitisation Project, pp.40-41. Martin, Peter, ‘Another View from St George’s’ - Queenscliff, pp.25-28. Reilly, Dianne, ‘La Trobe on the Bellarine Peninsula’, pp.7-14. Annear, Robyn, ‘Forty Thousand Bags of Gold Dust: La Trobe and the gold licence’, pp.43-47. Broome, Richard, ‘Charles La Trobe and the Modern World; Making sense of the gold rush’, pp.17-24. Friends of La Trobe’s Cottage - La Trobe’s Garden, p.53. Presland, Gary, ‘The Natural Environment of La Trobe’s Melbourne’, pp.35-42. Reilly, Dianne, ‘Duties of No Ordinary Difficulty: La Trobe’s goldfields management’, pp.7-16. _____‘S. T. Gill, the Artist of the Goldfields’, pp.50-52. Thompson, John, ‘Geoffrey Serle and the writing of The Golden Age’, pp.25-34. Dunstan, David, ‘Charles and Sophie La Trobe and the Vignerons: the Birth of an Industry in nineteenth century Victoria’ - A G L Shaw lecture, pp.7-18. Woodhouse, Fay, ‘A Most Companionable and Lively Man: Christian Ignatius La Trobe (1758-1836), pp.31-34. _____ ‘Winemaking in Central Victoria: the pre-history of Tahbilk’, pp.41-45. Breward, Ian, ‘Charles Joseph La Trobe in Melbourne and his Moravian Heritage’, pp.19-24. Chambers, Loreen, ‘Welcome to the La Trobe Society Christmas Cocktails, 2nd December 2010’. At the Alexandra Club, pp.33-34. Friends of La Trobe’s Cottage - Helen Botham (Chair) and John Botham (Vice-Chair) step down, p.45. Grant, James. ’Soulmates: C J La Trobe and Charles Perry’, pp.25-32. Holden, Colin, ‘A Musical Soul: the Impact of the Moravian Brethren on Charles Joseph La Trobe’, pp.13-18. Niall, Brenda, ‘Georgiana McCrae and the La Trobe Friendship’, pp.35-40. Schwirtlich, Anne-Marie, ‘Launch of The Making of a Statue: Charles Joseph La Trobe, 9 February 2011’, pp.41-42. Sherlock, Peter, ‘Religious Belief and Practice in Early Melbourne’, pp.7-12. Clemente, Caroline, ‘The Seeding of Melbourne’s Cultural Capital’, pp.22-34. Hancock, Marguerite, ‘The Life of Sophie La Trobe’, pp.17-21. Heathcote, Richard,	‘Charles Joseph La Trobe and the English Country House’, pp.5-39. Roberts, Bev, ‘A Black Apron View of History? Anne Drysdale & Caroline Newcomb, Victoria’s ‘Lady Squatters’’ - A G L Shaw lecture, pp.2-16. Armstrong, Helen, ‘Model of La Trobe’s Cottage: a research report’, pp.23-24. Cooke, Glenn R, ‘A Presentation Vase : a research report’, pp.25-27. La Trobe, Pamela, ‘The Story of an Australian La Trobe Looking for Ancestors’, pp.20-22. Latrobe, Pierre, ‘The Patronymic: the Latrobe/La Trobe Family Name’, p.2. Latrobe, Pierre and Janine, ‘Looking for Ancestors: the Origins of the Latrobe/La Trobe Family - Qui la cèrca la tròba: Who Seeks Will Find’, pp.3-7. Reilly, Dianne, ’Charles Joseph La Trobe: the Rambler in North America’, pp.8-17. Adams, John, ‘Welcome to The La Trobe Society at the Athenaeum Club, p.13. Bantow, Jennifer, ‘Two Employees of Charles Joseph and Sophie La Trobe: a research report’, pp.34-35. Lewis, Miles, ‘Jolimont in Context’, pp.2-12. Museum of Australia, ‘Rose Pellet’s Embroidery Sampler: research report’, pp.32-33. Badger, Jim, ‘’The La Trobes came in their Jaunting Car’: Keeping a Carriage in the Age of La Trobe’, pp.11-20. Macdonald, Judy, ‘James Watson and ‘Flemington’: a Gentleman’s Estate’, pp.1-25. Park, Kenneth W, ‘The Intrepid Traveller: Charles Joseph La Trobe’, pp.8-10. Reilly, Dianne, ‘La Trobe’s Grand Tour’, pp.2-7. _____ ’Charles Joseph La Trobe: Journeys and Excursions in Australia’, pp.26-27. Mullaly, Paul, ‘Crime in the Port Phillip District 1835-51’ - A G L Shaw lecture, pp.1-12. Murphy, Phyllis, ‘An Official Residence: La Trobe’s Cottage, the move to the Domain in 1961’, pp.12-15. Friends of La Trobe’s Cottage - Establishment, p.18. La Trobe Society Fellowship, 2009-10 : Dr Helen MacDonald, ‘The Mysterious Life of Henry Condell, Melbourne’s first Mayor’, p.17. Bantow, Jennifer, ‘Restoration of Charlotte Pellet’s Grave’, pp.19-25. 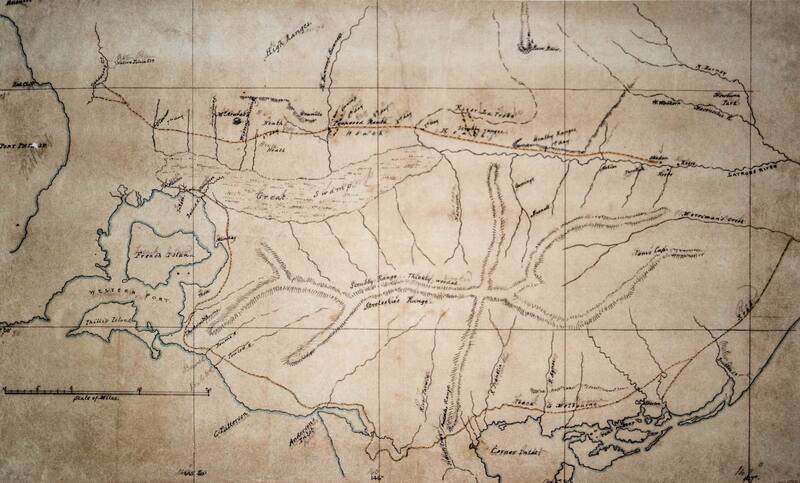 Caldow, Wayne, ‘Perceptions of Place: the Exploration and Settlement of Gippsland, 1839-1844’ - La Trobe Society Fellowship interim report, pp.11-13. Article. Reilly, Dianne, ’Charlotte Pellet, 1800-1877, Housekeeper at Jolimont’, pp.4-9. Thiele, Frances, ‘To Protect and Civilise: Superintendent La Trobe and the Abandonment of the Port Phillip Aboriginal Protectorate Experiment’- La Trobe Society Fellowship interim report, pp.10-11. ‘Benjamin Henry La Trobe [sic]' – portrait, p.18. ‘La Trobe Signage’ – Cape Otway, p.13. ‘Mathilde Chevalier’ – Latrobe Family member, p.18. Noone, Val, ‘From Charles La Trobe to Charles Gavan Duffy: Selectors, Squatters and Aborigines’ - A G L Shaw lecture, pp.3-9. Reeves, Simon, ‘The Walmsley House at Royal Park: La Trobe’s Other Cottage’, pp.12-18. ‘La Trobe’s Watercolours and Sketches’, pp.10-11. Corlett, Peter, ‘Australian Light Horse Sculpture – Be’er Sheva, Israel’, pp. 20-21. Grant, James, ‘Mutual Society, Help and Comfort: Charles Joseph La Trobe and Charles Perry, 1848-1854’, pp.7-16. Reilly, Dianne,	‘My Dear Mr La Trobe…’ – letters of Frances Perry (1855), pp.16-19. La Trobe Society Fellowship, 2008-09 : Dr Wayne Caldow, ‘Perceptions of Place: the European Experience of Gippsland, 1839-1844’, p.6. Obituaries – Dianna Baillieu and Suzanne Hunt, p.21. Thiele, Frances, ‘La Trobe and the Aboriginal People: A Challenging Relationship’, pp.7-14. Woodhouse, Fay, ‘Member in the General Division of the Order of Australia (AM) – Dr Dianne Reilly’, p.15. Kenny, Robert, ‘The Moravian Charles Joseph La Trobe’ - A G L Shaw lecture, pp.7-15. Reilly, Dianne, ‘Swiss Connections of Governor La Trobe’, pp.16-23. Clemente, Caroline, ‘La Trobe’s Summer: Diversions, Excursions and Seasonal Celebrations’, pp.10-15. Hargraves, Marita, ‘C J La Trobe’s Season in Van Diemen’s Land’ - 1846/47, pp.16-30. Reilly, Dianne, ‘La Trobe University – Occasional Address’. Graduation ceremony, 27 April 2007, pp.31-34. Inaugural La Trobe Society Fellowship, 2007-2008: Dr Frances Thiele, ‘Edward Stone Parker and the Aboriginal People of the Mt Macedon District’, p.5. Botham, Helen, ‘Renewed Interest in La Trobe’s Cottage’, p.12. Reilly, Dianne, ’Illuminating La Trobe’– illuminated address to mark the presentation of the bronze sculpture of La Trobe to the State Library of Victoria , pp.5-6: image p.11. Woodhouse, Fay, ‘A La Trobe in 21st Century Melbourne: Charles La Trobe Blake Down-under’, p.5. _____ ‘Creating the Mould: a conversation with Peter Corlett’, pp.6-12. _____ ’Unveiling of the La Trobe Statue’, p.5. _________ Henderson, Ray, From Jolimont to Yering, Kilsyth, Vic., Roundabout Publishing, 2006. Reviewed by Fay Woodhouse, pp.15-16. Blake, L B J, ‘Unveiling of a Commemorative Plaque at Geelong’ (1975), pp.12-16. Holland, John, ‘Unveiling of a Commemorative Plaque at Cape Otway Lighthouse’ (1975), pp.10-11. Priestley, Susan, ‘Jolimont Two Generations On’, pp.3-4. Waugh, Max, ‘The Beginnings of Education in the Port Phillip District’, pp.5-9. Alsop, Peter, ‘Charles Joseph La Trobe and Geelong’, pp.7-9. Reilly, Dianne, ‘La Trobe’s Discovery of Cape Otway’, pp.10-12. Hancock, Marguerite, ‘The Life of Sophie La Trobe’, pp.12-14. Landmark turns La Trobe on his head, p.16. Woodhouse, Fay, ’Charles Robb’s Sculpture of Charles Joseph La Trobe’, pp.2-3. Book Review – Brown-May, Andrew, and Shurlee Swain, eds., The Encyclopedia of Melbourne, Melbourne, Cambridge University Press, 2005. Reviewed by Fay Woodhouse, pp.6-7. __________ Waugh, Max, Forgotten Hero: Richard Bourke, Irish-born Governor of New South Wales, 1831-1837, Melbourne, Australian Scholarly Publishing, 2005. Reviewed by Fay Woodhouse, pp.5-6. Hare, Stephen, ‘National Trust announces 2006 as the Year of La Trobe’, p.2. Landmark, a sculpture of Charles Joseph La Trobe, p.3. Botham, Helen, ‘My Australian Home: A Walk around La Trobe’s Jolimont Garden’, pp.2-3. Pascal, Camille, ‘The La Trobe Arms and their Story’, pp.3-5. Obituary – John Davis McCaughey, pp.6-7. Barnes, John, ‘A Travel Note – La Trobe’s Grave’ and Clapham House, pp.7-8. Colville, Berres Hoddle, ‘Robert Hoddle: Pioneer Surveyor, 1794-1881’, pp.5-7. Lewis, Mary, ‘ Charles Joseph La Trobe: Portrait in Oils’, pp.2-5. Reilly, Dianne, ’150th Anniversary of La Trobe’s Departure from Victoria’, pp.1-2. Cohn, Helen, ‘Grevillea latrobei’, pp.5-7. Darragh, Thomas, ‘Ferdinand Mueller and Charles La Trobe’, pp.1-5. Riddett, Robyn and Fay Woodhouse, ‘ Jolimont Square Revisited’, pp.9-11. Woodhouse, Fay. ‘Post-Script for Melbourne: Art Work 150 Years in the Making’ – Installation using text of a La Trobe letter dated 19 October 1839, pp.7-9. Down, Geoffrey, ‘Sir James Frederick Palmer (1803-1871)’, pp.5-8. Hancock, Marguerite, ‘Miniature Mystery’ – portraits of Charles and Sophie La Trobe’s daughters, pp.1-2. Woodhouse, Fay, ‘Jolimont: Three Sides of a Square – Jolimont, Creating the Square’, pp.2-5. Obituary – Peter West, p.8. Connor, Margaret, ‘The Brontë Connection’ – Frances Jane Eyre at Fulneck School, pp.9-12. _____ ’James La Trobe and James Connor’, p.12. Morgan, Patrick, ‘Swiss Families in Gippsland’, pp.7-9. Riddett, Robyn, ‘Jolimont: Three Sides of a Square – London Squares’, pp.3-6. Obituary – Richard Elgin McGarvie, p.2. Heathcote, Richard, ‘The La Trobes’ Jolimont Garden’, pp.1-2. Nash, Robert, ‘The Huguenot Background of Charles Joseph La Trobe’, pp.2-4. Priestley, Susan, ‘Down a La Trobe Alley – but is it blind?’ (letter from artist John Sell Cotman referring to ‘drawing master La Trobe’), pp.5-6. Obituary – Edward Carlos Carter (editor-in-chief of the Benjamin Henry Latrobe Papers), p.6. Reilly, Dianne, ‘Christian Ignatius La Trobe’, pp.3-4. Shaw, A G L, ‘The Role of Lieutenant-Governor of Victoria’, pp.1-2. Taylor, Neil, ‘Why La Trobe’s vision must prevail at Point Nepean’, p.5. Tyrrell, Allan, ‘Austin Latrobe Motor Cars’, p.4. Bishop, Douglas F, ‘The Second Mrs La Trobe’ – unveiling of the portrait of Rose de Meuron-Montmollin and Margaret Rose La Trobe, p.3. ‘The Establishment of the Latrobe Fellowship, U.S.A.’ – named for the architect Benjamin Henry Latrobe, pp.5-6. Latrobe, Tim, ‘Austin Latrobe’ - motor car, p.5. Priestley, Susan, ’Seeking 96 Victorian School Boys of 1951’ (attendees of a memorial service in Litlington on Victoria Day, 1 July 1951), pp.2-3. Heathcote, Richard, ‘Jolimont Revived: research into the La Trobe's garden home’, p.3. Lewis, Mary, ‘The Puzzle of the Portraits’ – Portrait in Oils of Charles Joseph La Trobe, pp.2-3. 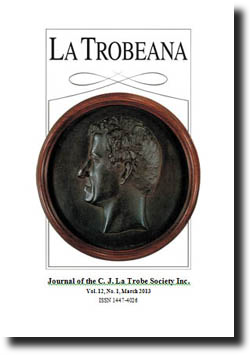 Shaw, A G L, ‘C J La Trobe: La Trobe Society Inaugural Address’, pp.1-2. Early issues have been scanned and may contain some typographical errors.